But you really should. Sometimes it makes a lot of sense to simply upgrade your current computer(s) instead of replacing them. Just like cars, we all like new computers; everything is faster and better. A new computer is kind of like buying a new car. Who doesn’t like to drive a new car and enjoy that new car smell? I don’t know anybody who doesn’t like to drive a brand spanking new car off the dealer lot. A new computer, in its own unique way, offers some of that same enjoyment. It will put a smile on your face and confidence in your user experience—once you’ve spent the hours getting all your software reinstalled and getting everything set up the way you’re used to. If that describes you, a computer upgrade may make sense simply based upon the very affordable cost of the upgrade. But before we get too far down the road let me say up front that sometimes a computer upgrade makes sense and sometimes it does not. Sometimes you can’t do an upgrade. Why? You may have to purchase a new computer to run a new Line of Business (LOB) software that will impact your entire company. Most software comes with recommended hardware specifications that must be met for the software to work properly or work well. This is especially true in LOB software that will impact an entire organization for better . . . or for worse. For example, if you’re considering a new engineering software program, a payroll program, or some other LOB software your current hardware or operating system may not meet the specifications of the new software. As an IT Support company, we see this time and again. In these types of situations, an upgrade may or may not be economically feasible. What about computers that don’t meet this description? You know, your older computers do the same job they’ve always done, with the same old software they’ve always had. But nothing new is going to happen with them! Sure, they’re older, and they’re reliable for the job they do, but admit it: they’ve been getting slower and slower over time and it’s getting aggravating and it’s really slowing down your workflow. Upgrading these computers often makes sense. There are two key upgrades that will provide immediate and profound benefit to almost any desktop or laptop computer: Replacing your old, mechanical, spinning hard disc drive (HDD) with a new solid-state drive (SSD), and in some cases also upgrading the system RAM (memory). The faster speed of an SSD is at the least very impressive. The cost can be as little as $250.00 for a computer upgrade which sure beats the price (and hours of setup hassle) of a new computer. 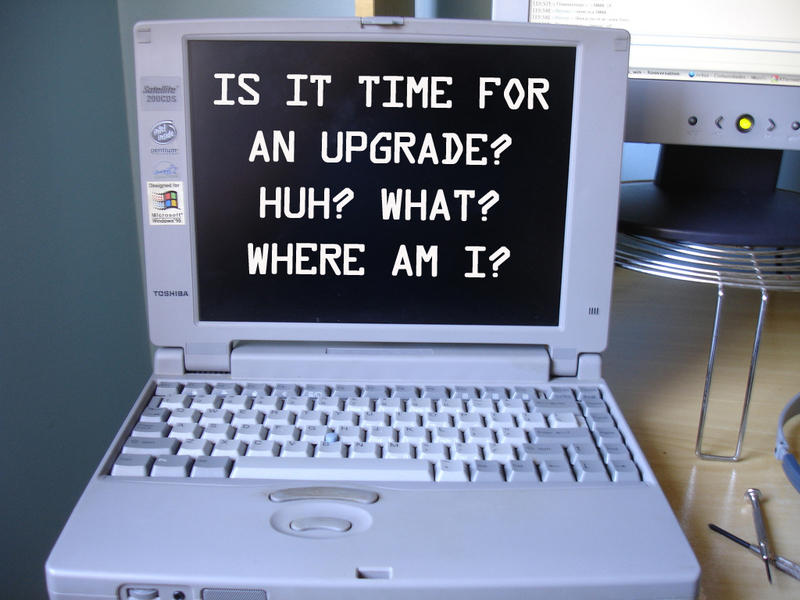 The benefit of an upgrade is that it will not only extend the life of that old reliable computer that has been at your company for years, it will also greatly improve your efficiency. It’s true! We provide and recommend an SSD replacement in those situations where it makes sense—and frankly, that’s most of the time! Unsure about the reliability or performance of SSD’s versus HDD’s? Don’t be! Reliability: SSD Drives contain no moving parts. As a result, they typically last many years longer when compared to their older mechanical cousins. Speed: Older hard drives operate like an old record-player—physical heads (like a tonearm) are moved back and forth across a spinning disk. As a result, everything requires time for the head to move into position and the disk to rotate to the proper spot under the head—potentially hundreds of times per second. All those access delays add up, potentially adding seconds or even minutes to everything you do. SSD’s contain no moving parts—just “chips” that electrically store information. With no moving parts, reliability and performance are greatly improved—an SSD can read from the beginning and the end of the drive almost simultaneously, translating into relatively-instant program launches and file opening. Cost: SSD’s have plummeted in price over the last five years as supply has ramped up to meet demand. An SSD that used to cost $500 back then is under $100 today, making SSD upgrades more affordable than ever. If you’re interested in saving money at your company—and who isn’t—having reliable computers that just work, and not spending hard earned money you don’t have to, an upgrade is worth looking into. Again, we do it here when it makes sense. The older computer I use every day has been upgraded and it runs great; it’s true! An HDD to SSD upgrade is a great solution for older systems in need of a little TLC, known as a computer upgrade.